This week, we’ll be showing the Russian film The Island (“Ostrov”, Pavel Lungin, 2006; Russian with English subtitles), about a small Russian Orthodox monastery and the life of a Fool for Christ’s Sake who lives as a monk there. The film won a lot of awards in Russia when it came out and it is a pleasure to watch. Looking forward to seeing you all, this Thursday, October 26, at 7pm, as usual in the House of Ss. Gregory and Macrina, 1 Canterbury Road, Oxford, OX2 6LU. The film will be followed by a bring-and-share meal, so please bring whatever food or snacks you can! Come join us this week to mark the start of term with a Moleben (Paraclesis/Service of Intercession) to St. Frideswide, the patroness of the city of Oxford, Oxford University, Oxford students, and, of course, of our Society. It will be taking place on at 6.30pm on Thursday, October 19 (her feast according to the New Calendar), in the Church of the Holy Trinity and the Annunciation, 1 Canterbury Road, OX2 6LU, which is located in the garden of Saint Gregory’s House where we have most of our events. Please come along and offer your prayers to Saint Frideswide for the beginning of the new academic year! The service will be followed by a social evening with cake and tea, so if you can, please bring your own favorite desserts and sweets to share. The Oxford Journal of Law and Religion is hosting a workshop ‘Middle Eastern Christians in Europe: Faith, Identity and Integration’. 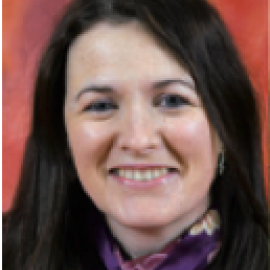 The workshop is conducted by Dr Fiona McCallum, lecturer in International Relations at the University of St Andrews. The respondents include Dr Robin Gibbons (Regent’s Park College, Oxford), Anthony O’Mahony (Heythrop College, University of London) and Dr Peter Petkoff (Regent’s Park College, Oxford & Brunel University, London). Dr McCallum’s research focuses primarily on the political role of Christian communities in the contemporary Middle East. This includes government integration policies towards Christian communities, identity issues, Christian political participation in the region, Muslim-Christian relations, religious leadership and diaspora. She is the author of Christian Religious Leadership in the Middle East: The Political Role of the Patriarch (2010). She is currently leading a collaborative interdisciplinary project funded by the European Union entitled ‘Defining and Identifying Middle Eastern Christian Communities in Europe’ with partners from Denmark, Poland and Belgium. Dr McCallum is a Visiting Research Fellow at the Centre for Eastern Christianity, Heythrop College, University of London for 2015. Tuesday, 12 May 2015, 10am – 4pm, Balliol College, Old Common Room. The Oxford Journal of Law and Religion and the Oxford Society for Law and Religion are running a colloquium on faith, freedom and foreign policy at Balliol College on Tuesday, 12th May. It features excellent speakers and important topics, with a special one-hour session on problems of Orthodox Christianity in the European Union by one of the leading experts in the field. OrthSoc opens Trinity Term 2015 with a major conference on Anglican-Orthodox relations. 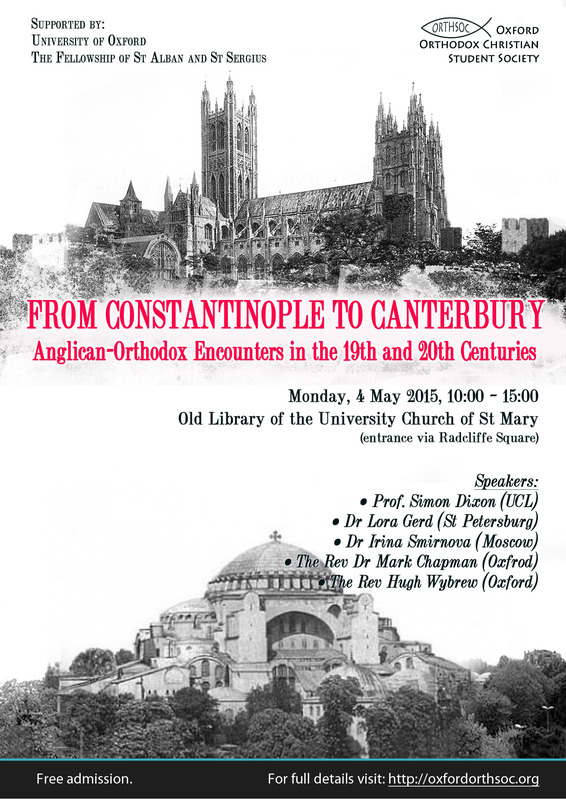 Monday, 4 May 2015, 10am – 3pm, Old Library of the University Church of St Mary. The conference explores Anglican-Orthodox encounters in the Holy Land and the Middle East, Orthodox Christian mission to Great Britain and contacts between the Church of England, the Patriarchate of Constantinople, the Russian and the Serbian Orthodox Churches, as well as ecclesiastical and theological aspects of the Anglican-Orthodox dialogue. The conference is jointly supported by the University of Oxford and the Anglican-Orthodox Fellowship of St Alban and St Sergius. Read more and download the conference programme. The OrthSoc Committee is currently planning a term programme for the next academic year. If you have an idea for a social event or a discussion group, or if you know a great speaker who should definitely appear at OrthSoc, feel free to tell us about it by using this form. We look forward to your great ideas! Christ is Risen! He is Risen Indeed! Happy Easter! “Identity and Individuality: Psychological and Spiritual Growth in Gregory of Nyssa, Maximus the Confessor and Fyodor Dostoevsky”, Saturday 14th March, St Theosevia House, 10.30am – 4pm. Dr Johannes Zachhuber, Professor of Historical and Systematic Theology, Fellow and Tutor in Theology at Trinity College, Oxford. He is a historical and systematic theologian specialising in the Eastern Patristic tradition of theology and modern theology from the Reformation to the present, with special interests in nineteenth-century German theology. He is the author of “Human Nature in Gregory of Nyssa“ (Brill, 1999 & 2014) and “Theology as Science in Nineteenth-Century Germany” (OUP, 2013). T he Revd Dr Grigorios Chrysostom Tympas, an independent scholar, a priest and a pastoral counsellor in the Greek Orthodox Church in London. He received degrees in medicine and theology from the Aristotle University of Thessalloniki and a PhD in Psychoanalytic Studies from the University of Essex. His doctoral thesis has been recently published as “Carl Jung and Maximus the Confessor on Psychic Development” (Routledge 2014). M s Irina Kirillova MBE, formerly Senior Lecturer in Russian Studies, Department of Slavonic Studies at the University of Cambridge, Fellow Emerita of Newnham College. She is the author of “The Image of Christ in the Writings of Dostoevsky” (In Russian, 2010) and “Encounters: Notable Russian People in Russia and Emigration” (In Russian, 2012). The venue: St Theosevia House (2 Canterbury Road, OX2 6LU). Attendance is FREE for students with card. Non-students £5 (on door). No booking is required. Lunch break 1-2 pm (please provide your own lunch).